So, what is this? In short, these are wizard schools, not organized by spell school, but instead by theme; they otherwise work just like the regular arcane schools, including opposed schools that need to be chosen, etc. The schools thus introduced would be commercial, court wizard, entertainer, hedge wizard, investigator, lord, mentor, mystic. Beyond the spell-lists provided for the respective schools, there is some guidance for GMs to integrate spells in these schools, which include the rule of fun/pun – the associated spell-lists, thus, do make sense and generally are rather well-constructed. The schools follow interesting paradigms – one would be one that can be explained via the commercial school: The base ability allows you to use detect magic to determine the value of items. Starting at 5th level, the school allows for the suppressing of magical item abilities – as a minor complaint, the mechanic here uses an opposed caster level check, which is uncommon for PFRPG and not something I fancy too much due to the swingy nature of opposed rolls. Said suppressed spell may be prepared by the mage, with higher levels unlocking progressively more powerful magical items to be thus manipulated. Intriguing – the school can generate a slow bolt that becomes faster if the target does not keep his distance and 8th level allows you to booby trap items. The abilities, even in cases where I do not 100% love the specific execution, the abilities are not lame, boring or uncreative – they utilize complex tricks and let the wizards do things not otherwise possible, which is a big plus for me. Court Wizards let the caster add aid another to the recipients of spells, even at range and another one, allows the respective wizard to use his magical force to move targets out of harm’s way and, at 8th level, exalt allies with flexible bonuses. Entertainer wizards can generate magical, nonlethal damage causing streams of rotten fruit or, at 8th level, generate a kind of illusory spotlight, which is pretty cool. Hedge Wizards are problematic – you can prepare spells with random numeric variables and affect them to deliver minimum results…but with a Spellcraft check, the spell is not expended. I am not a fan of this one, since it allows for infinite spellcasting of petty spells. An increasing DC would have helped here, as would a check that is not as easily maxed as a skill. That being said, I do like the option to enhance cantrips or endow magic in mundane items for other characters to use and while I disagree with the particular rules-solution here, it at least is precise. The Investigator school is cool, allowing for better interrogation of targets or the addition of trailing acidic paint to targets is cool. Oh, and the school has the means to capture foes alive and bind them into nonmagical items that then grant bonuses to the wizard! Yeah, that can be spun in really nasty or really benevolent ways…cool! Lords are all about controlling targets, coaxing them into action and leech power off them -you get the idea. Mystics of 8th level can suppress mind-affecting effects and, as a whole, I really like the creativity the respective schools did exhibit here, from the teacher’s role of the mentor to the other ones – there is merit to be found in all of them -so kudos! Editing and formatting are top-notch, I didn’t notice any significant glitches. Layout adheres to Frog God Games’ two-column full-color standard and the pdf sports nice, original b/w-artwork. The pdf has no bookmarks, which constitutes a slight comfort-detriment. Hal MacLean’s schools of thought are intriguing. While there are some components I disagree with in their respective execution and some minor bits here and there that could be slightly more precise and while adding other spells to the schools is a bit of work, the schools do provide unique options and playing experiences, which is a pretty big thing for me. At the same time, this does mean that the pdf is harder to employ and requires some work for the GM to use in the long run. While not perfect and slightly more work than I like to see, as a whole, this is a creative and fun offering well worth of a final verdict of 4 stars. 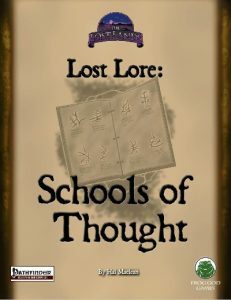 You can get these alternate schools here on OBS or here on tabletoplibrary.com!